In Which the Pirate Scrubs Up. The spinning project proceeds (but all the pictures look the same, so...) Meanwhile, Michael's birthday was last week, and he'd mentioned that one of his washcloths was starting to look a little thin. 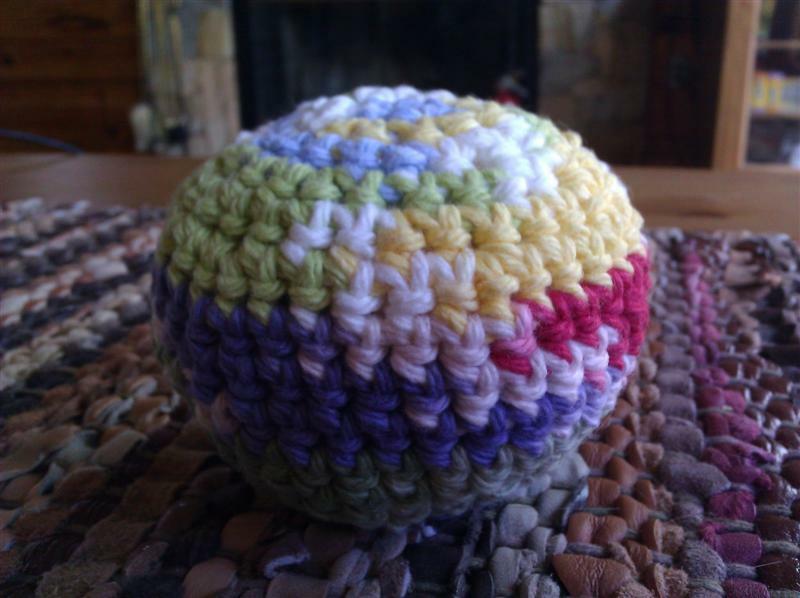 I can get two cloths from one supersize ball of yarn, so I made one for Michael and gave the second to my brother. Goodness knows I have enough of my own at the moment. The washcloths are made of Sugar 'n Cream in the Hippi colourway (with white for a border on one of them), and I went down one hook size from my usual (from 5.5 mm to 5.0 mm) to try to get a tighter fabric. 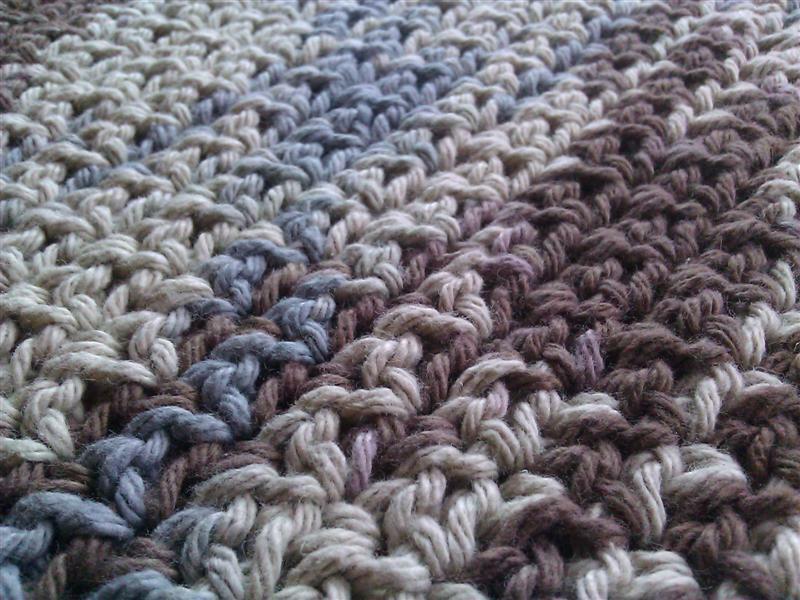 The pattern is my favourite, Woven Stitch Dishcloth. With the larger hook I know that if I start with a chain of 38, I'm likely to get argyle - but with the slightly smaller hook, that didn't work out as well. I'll have to figure out the numbers when I make the next cloth, because I do like the smaller stitches. 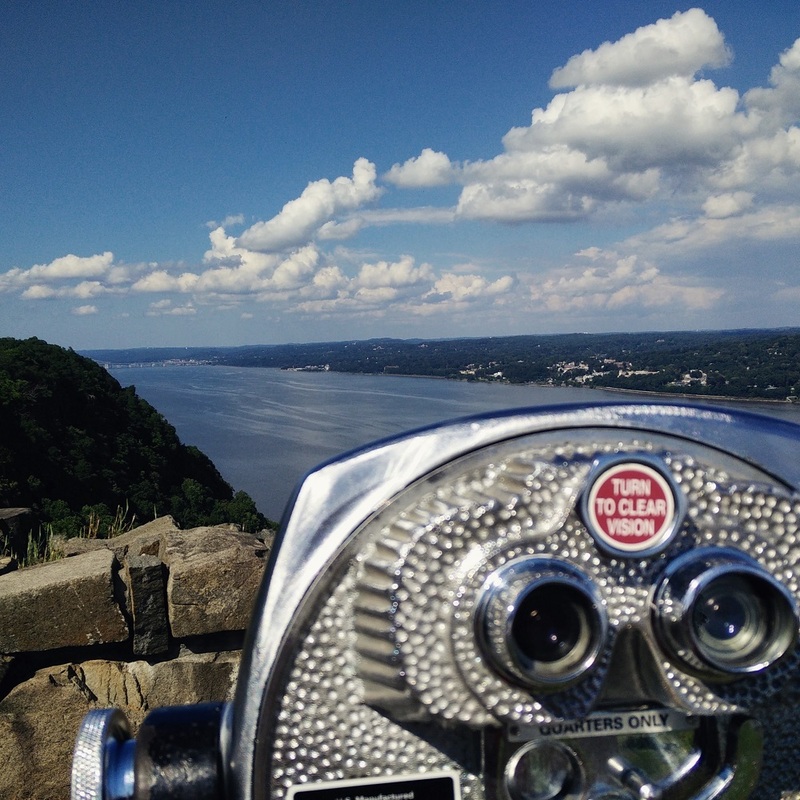 I drove up to Connecticut so that I could bring my bike (no pictures from the ride, unfortunately, but it was fun) and on the way I stopped at Palisades Interstate Park to stretch and take in the scenery. The Tappan Zee bridge is just barely visible at the turn of the river; I drove over it shortly after taking this picture. Comments Off on In Which the Pirate Scrubs Up. In Which the Pirate Goes for Instant Gratification. Boy, things have been busy around here! Lots of good stuff going on. Unfortunately, that's meant less time to play with yarn - but I found a couple of hours to crochet a new washcloth from a ball of Sugar 'n Cream that's been staring at me from the shelf for several months. 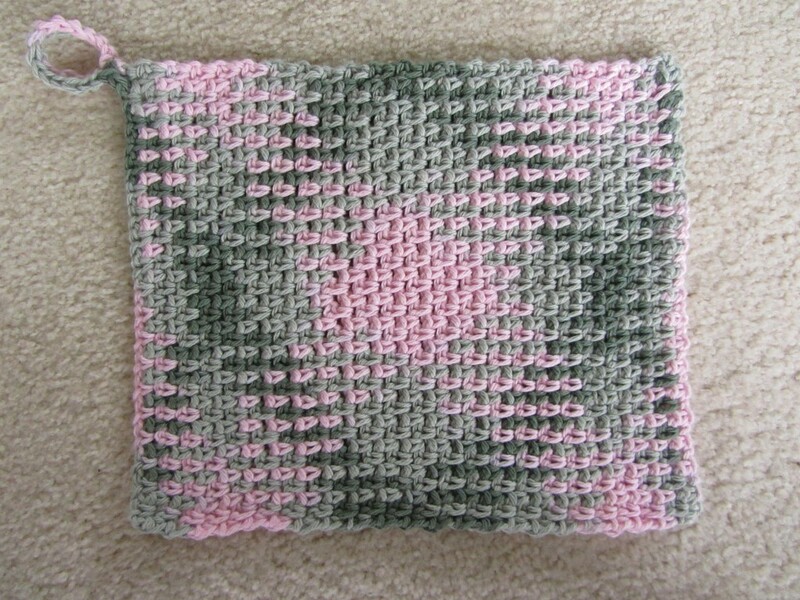 The pink and gray combination is one of my favourites, and I know that if I use the Woven Stitch Dishcloth pattern and begin by chaining 38, I'll get argyle. Somewhere in the middle my tension changed, and I had to rip back a few times so that I could adjust to get the argyle pooling right. So this wasn't quite *instant* gratification, but still, I went from a ball of yarn to having a new washcloth in only a few hours. Close enough! Comments Off on In Which the Pirate Goes for Instant Gratification. In Which the Pirate Makes Washcloths. Crocheted washcloths might be my new favourite project. They're quick, they're easy, they hold up to repeated washing and drying, and they're amazingly useful! I always have one in the shower for washing my face now; it's got just the right amount of scrubbiness without being too rough. Every crocheter (crochet-ist?) has to learn the ripple at some point, right? How else can we make those iconic 1970s afghans? There's one on my couch, of course, and Kipling has claimed it for his own. 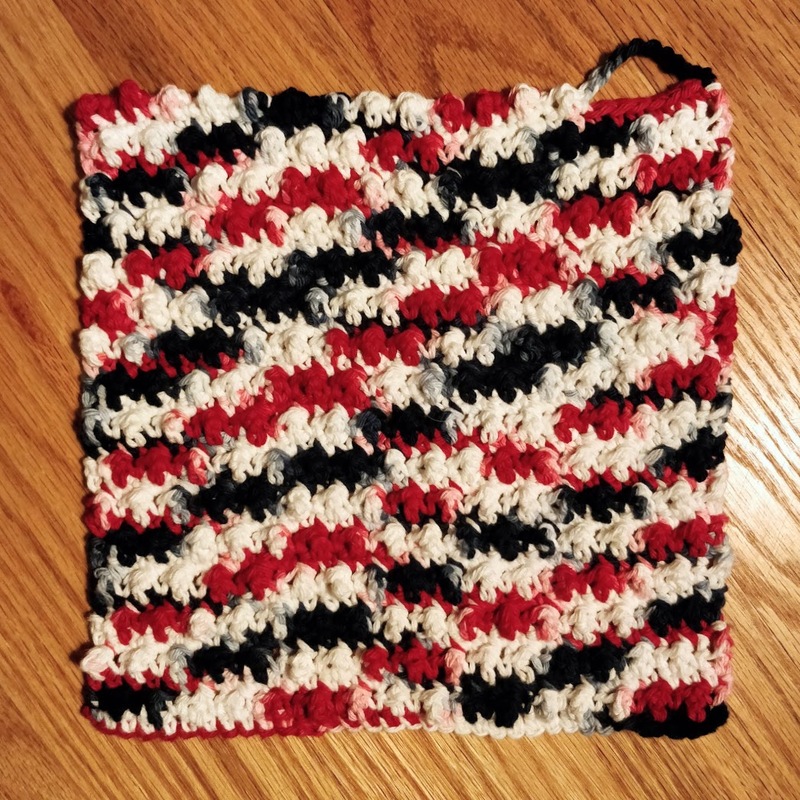 The thing is, it actually belongs to Pirate-Ex... so I figured I'd practice the ripple stitch with a washcloth, in preparation for making the replacement blanket. 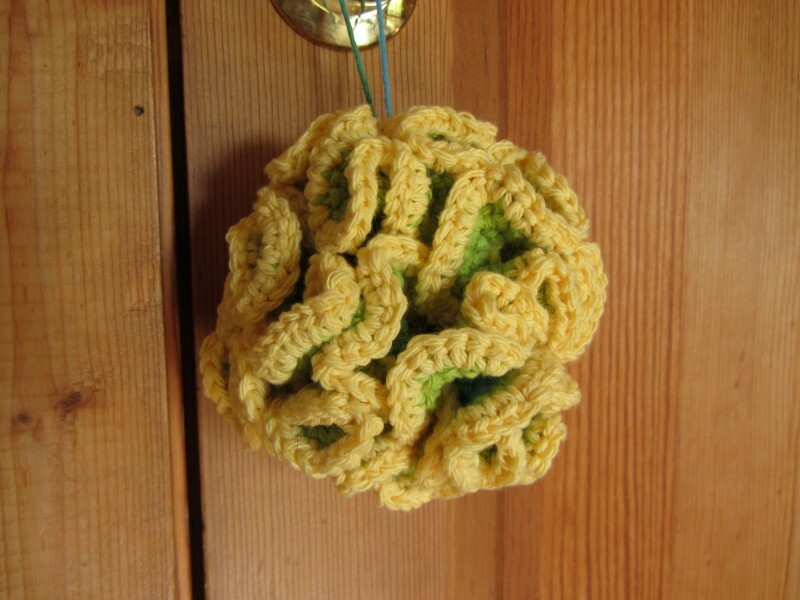 Then I thought I'd try some hyperbolic crochet (aka a bath foofy) with the green leftovers. I used up the variegated yarn first, then the solid green, then wanted to do one more round for extra foofiness, so broke into a ball of yellow for the last round. This was really, really fun to make! 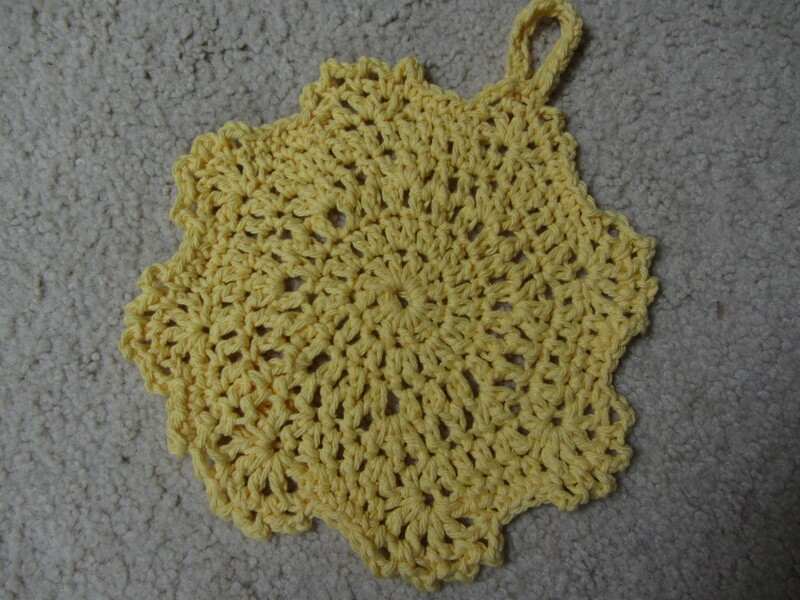 I had about half of the yellow yarn left and didn't know how far it would go, so I decided to work this Shell Point washcloth from the inside out. 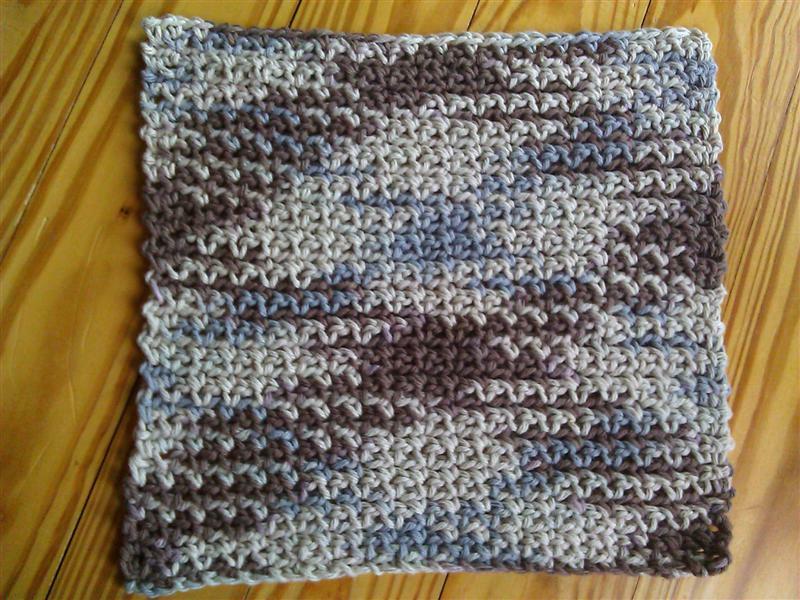 Next I took a random stitch pattern and made a washcloth of it. I like how it waves! 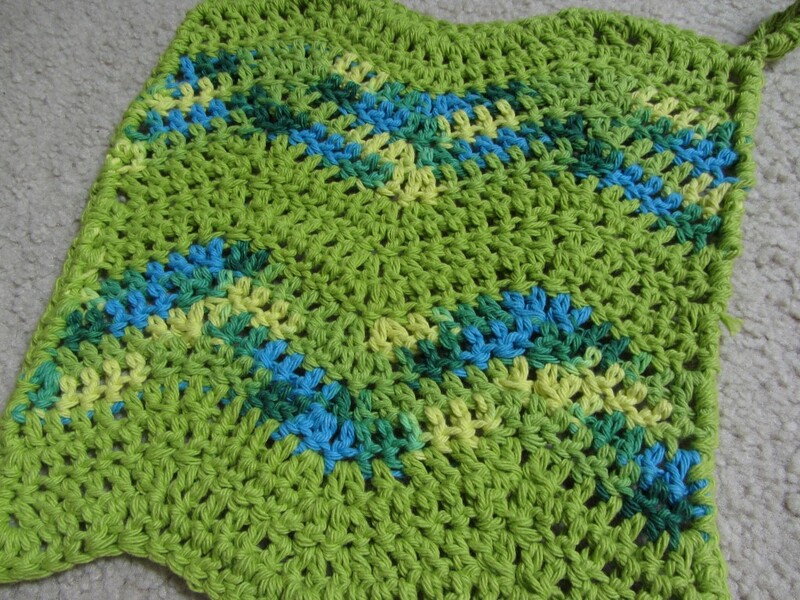 I think this would look good in a solid or semi-solid colour as a baby blanket. Not that I plan to make one any time soon, but still. One needs something to do with one's hands whilst watching F1 races, even exciting ones like this year's Monaco GP. I just did a simple thing with some more leftovers, alternating single and double crochet until I ran out of yarn. The zigzags are nifty! Comments Off on In Which the Pirate Makes Washcloths. Last night I went down the mountain to my neighbour Sarah's house to have a beer and conversation. I knew she'd be working on crocheting snowflakes and wanted to bring something with me to keep my hands busy - but my sock was still out of commission. 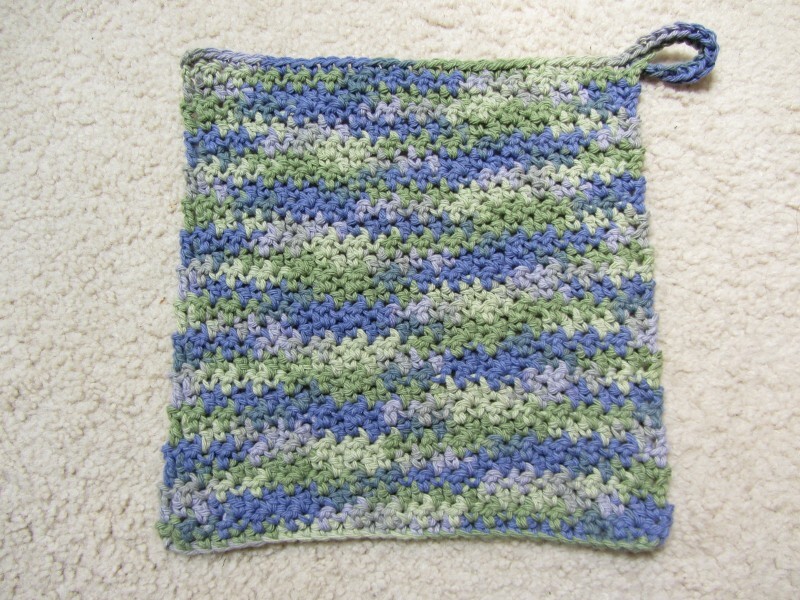 I decided that a quick and easy washcloth would be the way to go. 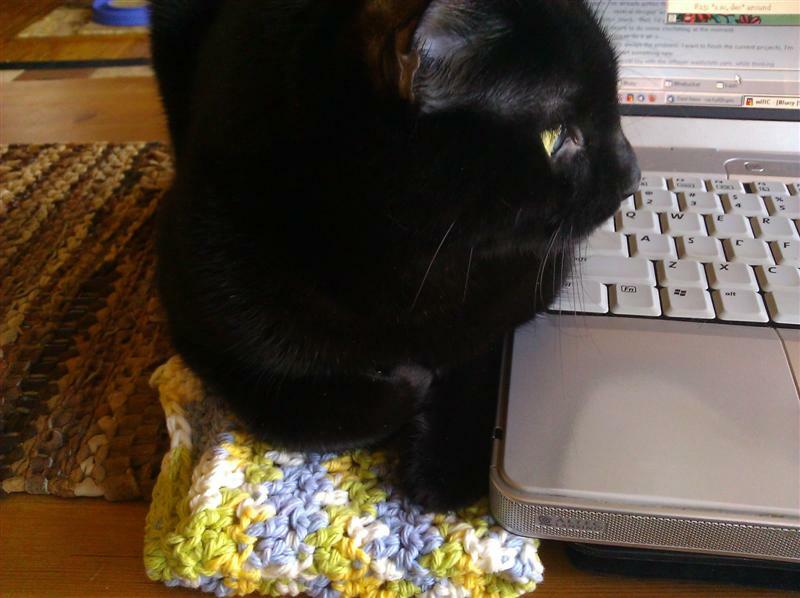 This morning I finished the last few rows and folded the new washcloth beside my laptop, planning to bring it upstairs with me and weave in the end the next time I got up. Floyd claimed it as his own before I had the chance. Then I tried to spread it out on the table to take a picture. That didn't go so well. 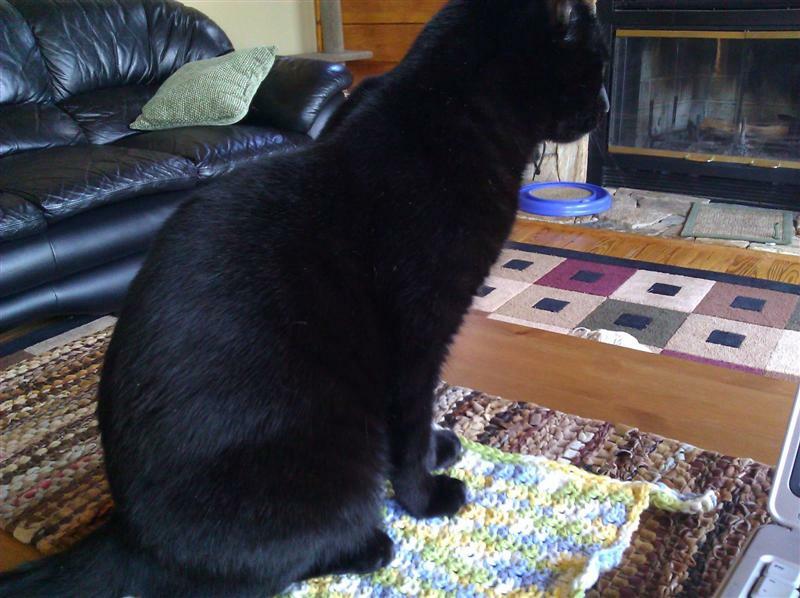 Floyd was torn; he hates having his picture taken but he didn't want to abandon his new washcloth, either. Attempting to relocate him was less than successful. Finally I pulled the cloth out from under him, put it on my keyboard, and got a reasonably good picture of it. This yarn. 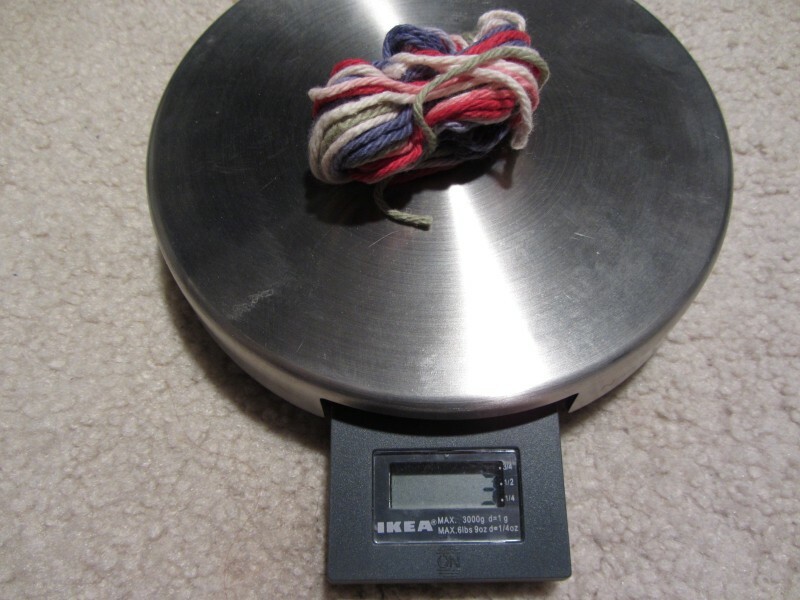 Oh, this yarn. 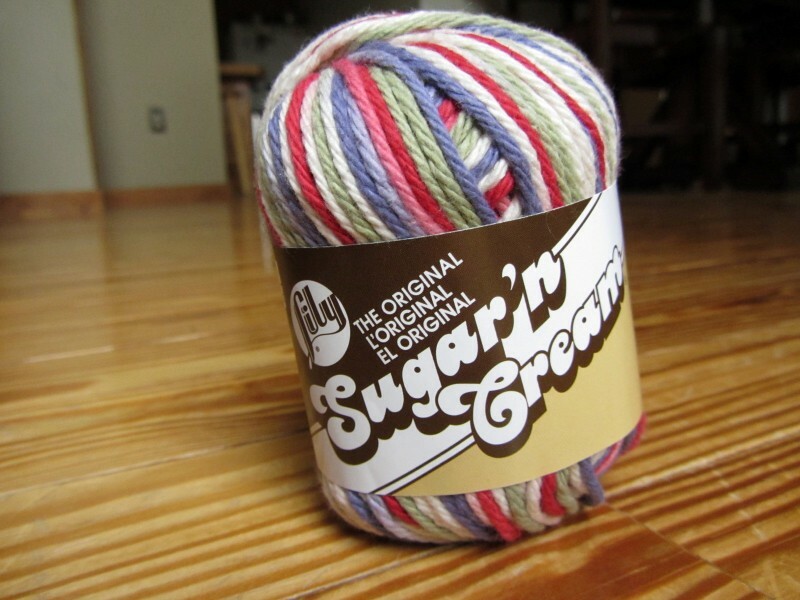 I love crocheting Sugar 'n Cream, but this colourway was difficult. I must have tried five different patterns, different starting chain numbers, starting at different sections of the colour repeat. Nothing worked. It came out blotchy, stripy, ugly... anything but attractive. Finally I gave up trying new patterns and went back to the Bumpy, Not Lumpy pattern that I've made a few times before. 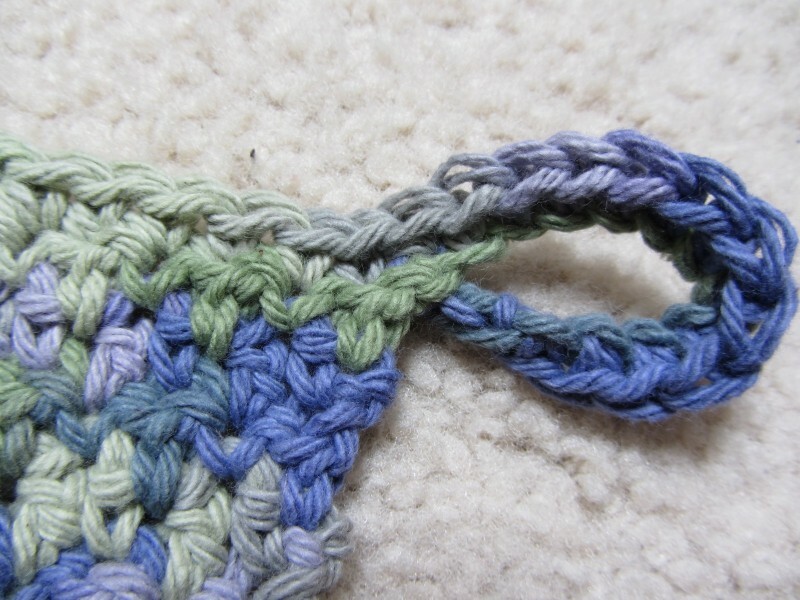 It's easy to do and gives a nice fabric for a washcloth. Besides, I barely need to look at it while I work! Because Floyd seemed to like the washcloth so much, and because I still had a handful of yarn left over, and because I hadn't yet decided what to work on for the rest of the afternoon, I made a quick cat toy using the free Tiny Crochet Ball pattern and the size I (5.5mm) hook that I was still holding from the washcloth, and leftovers from two other washcloths as well. I probably should have used a smaller hook for a tighter fabric, but I think it will be all right. In Which the Pirate Slowly Crochets. 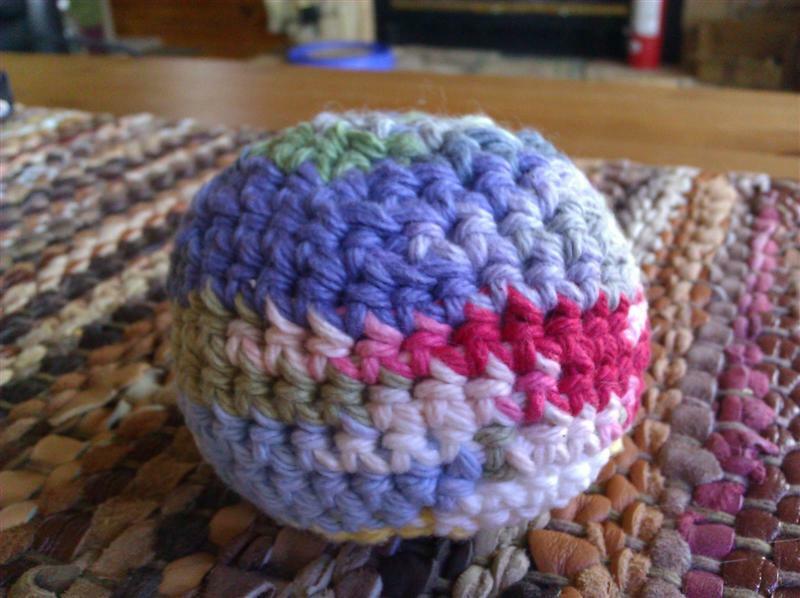 The third annual Knitting and Crochet Blog Week was so much fun! I read a ton of new-to-me blogs, got lots of ideas and inspiration, and learned about stitches and patterns that I might have otherwise missed. Plus I've jumped to nearly a hundred RSS subscribers (through Google Reader; I don't have stats for other RSS readers) and almost 250 followers on the Knitting Pirate's page on Google+! (I think some of them might not be real accounts, but whatever...) Eskimimi is truly marvelous for organizing and arranging the event, and I know I'm not the only grateful blogger out there. 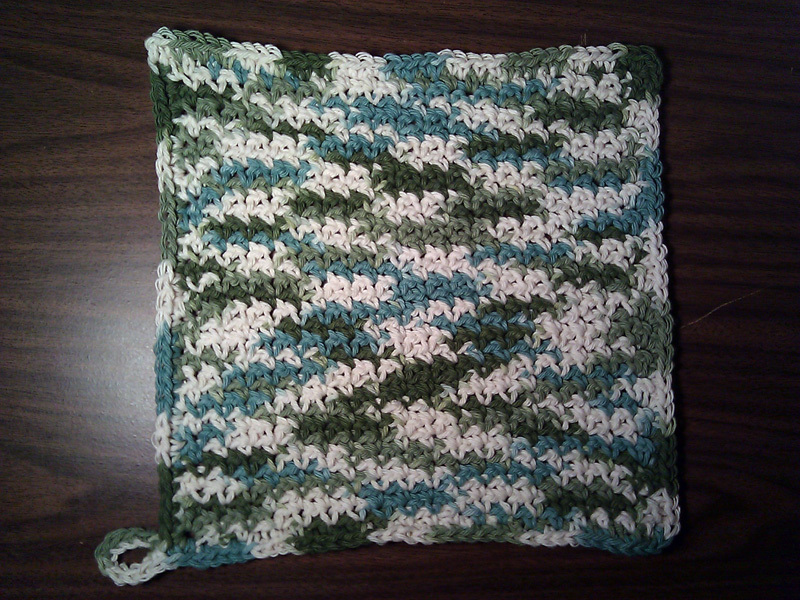 While Blog Week was going on, I was making slow progress on a washcloth. It was slow going because I seem to have sprained my wrist. How, I'm not sure. But it hurts when I move it in certain ways, so I'm being careful to take lots of stretch breaks, and I'm trying not to work too fast, which causes me to have a death grip on the hook and can add to the strain. This is the second time I've crocheted the "Bumpy Not Lumpy" pattern, which you can find for free on Chocolate Mints in a Jar. I started off by chaining 37 as per the pattern instructions, but after only a few rows I realized that I was going to have a much bigger cloth than I wanted, so I ripped back and began again with a chain of 29. 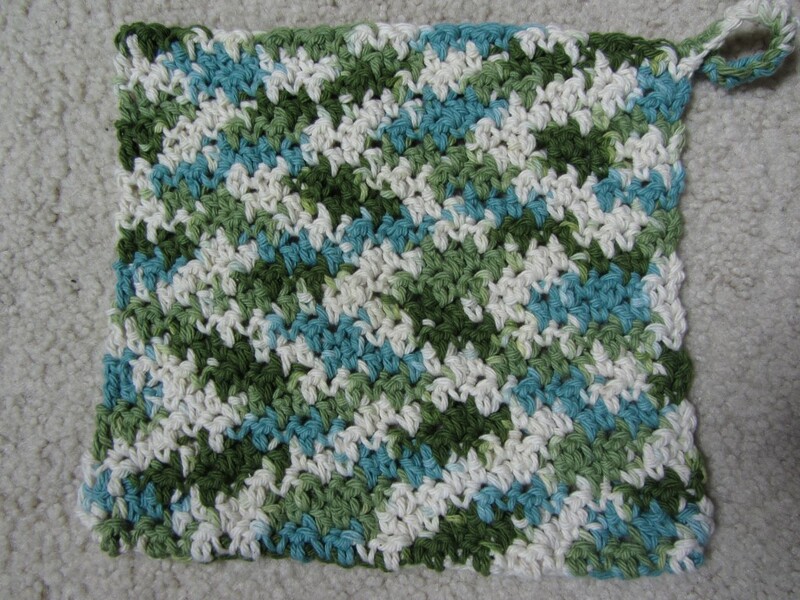 This gave me a 9.5" square cloth and a pretty nifty pooling pattern. I made sure to note this on the project page so that if I make this pattern again, I'll know how many stitches to start with. I like to hang my washcloths from the shower caddy to dry, rather than draping them over the towel bar - not to mention that I'd rather have water drip into the shower than onto the floor! I think they dry faster that way and are less likely to smell funny. I made the loop by chaining a dozen or so stitches, then single crocheting the length of the chain beginning from its base and working around, then working the last row of the pattern. Since the last row is a single crochet top edge, it worked in quite nicely and doesn't feel as if it's going to pull loose. I didn't do the edging all the way around, but I think on my next fully-edged cloth I'll work the loop before the edging. I like the way it gets incorporated in. Washcloths are fun and quick, but I have to get my focus back to the Dancing Cranes stole now. Sure, it's only the beginning of May, but I'd like to have it checked off my list well before its October deadline. I'm into the second pattern repeat and there's no reason for me to be frantically knitting at the last minute, other than my own tendency to procrastinate - which I'm trying to overcome. Here goes! Hold me to it! In Which the Pirate Cheats a Little. Yes, I know I said I wouldn't start anything new until I'd finished my current projects, but what kind of treat is yarn that I'm not allowed to touch? 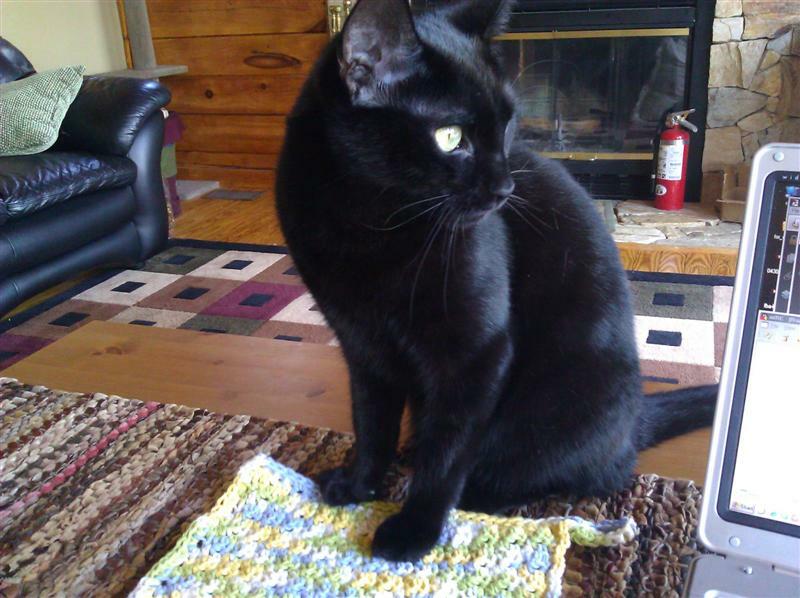 Besides, I needed a new washcloth. So I began yet another, using the free Woven Stitch pattern for the third time. 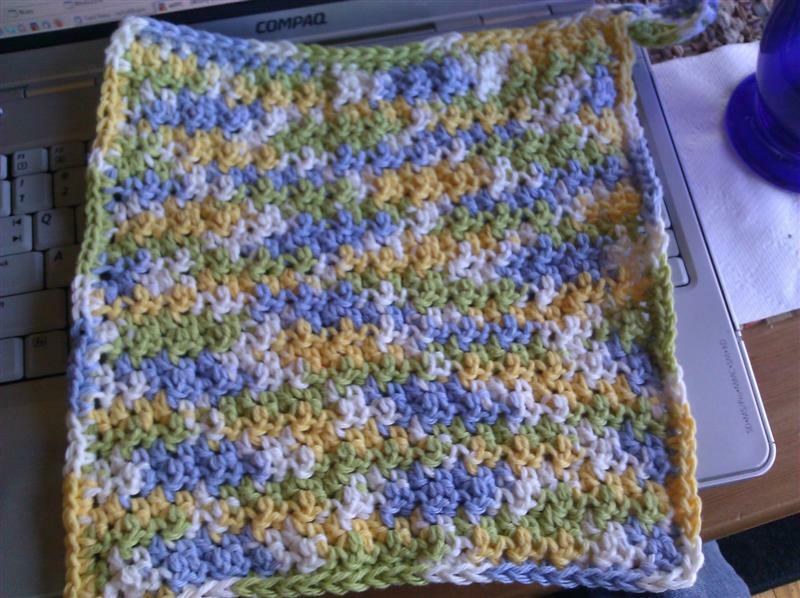 I guess that makes it my favourite washcloth pattern so far. It's easy to memorize and works up quickly - okay, to be fair, most washcloth patterns are like that, but I just keep coming back to this one. Maybe next time I'll try something new. Pirate-Ex (I'm going to have to come up with a better name for him. Seriously.) asked if I'd make a white washcloth for him with a less hole-y fabric, something really thick and dense. I'll find a good pattern and drop down a hook size, and it should come out to be what he's looking for. For this one I started with a chain of 38, since that's given me a good-sized washcloth before, and crossed my fingers that I'd come up with another argyle - and I did! The first time I made this pattern, the argyle worked out perfectly. The second time, I got zig-zags instead. Those didn't look bad, but I'm happy to have gotten the argyle again! It's more clear in person; for some reason the picture makes it look much more messy and colour-splotched. 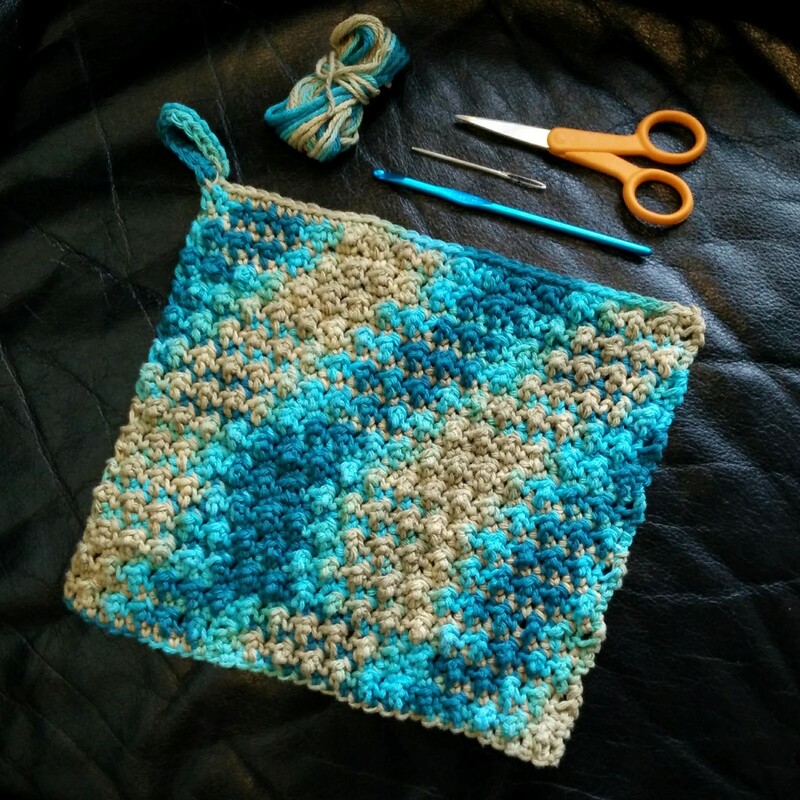 It only takes two casual evenings to crochet a washcloth, and if I work in a relaxed mindset and don't try to hurry, it doesn't strain my wrist too badly. In addition to the instant gratification of finishing a project in a few hours, there is something incredibly soul-satisfying about using my hand-crafted work in such a mundane manner. It makes me look forward to the next time I wash my face! Maybe it's the way the colour has played out, or maybe I changed something about how I'm forming the stitches, but it seems that the stitch pattern looks slightly different from the last time I made this pattern. No worries, it's still a perfectly functional - and pretty! - washcloth. I worked a simple single crochet border around the edges and included a loop so that I can hang it to dry. I had three grams of yarn left when I was finished. Not bad, not bad at all! Comments Off on In Which the Pirate Cheats a Little. In Which the Pirate Has Helpers. I ordered the Silken Kydd yarn from Elann for the Dancing Cranes stole, and I'm totally impressed with their shipping time. I placed the order on Sunday night and got the yarn on Wednesday morning! The pattern calls for three balls of yarn and three pattern repeats to make a 14.5" by 80" stole. I ordered a fourth ball in case I'm crazy enough to want to do an extra 8400 stitches of a fourth pattern repeat for a slightly wider stole, or just in case three isn't quite enough. Since I want it finished for cousin Dianna's wedding in May, I'm going to have to get started right away. Even if I only knit one row a day, it will be done in time. I'll cast on this weekend and see how far I can get. 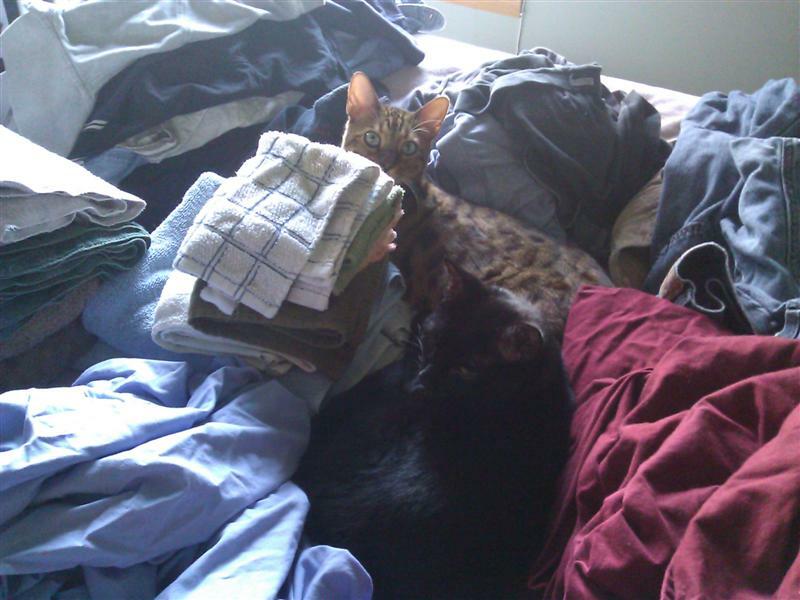 Floyd and Kipling are the best laundry helpers I could have wished for. They're also a great incentive to put the laundry away as soon as it's out of the dryer. Otherwise they will shed on it, use it for a jungle gym or as a hiding spot for guerrilla warfare or as a perfect napping hammock. Cats are great, aren't they? Happy Feline Friday! Comments Off on In Which the Pirate Has Helpers. In Which the Pirate Arrrr-gyles. When I picked out this "Earth Ombres" colourway of Sugar 'n Cream, I thought that Michael might like the blues and browns. I was right, so I'll be giving him this washcloth the next time I see him. I used this free pattern from Linda Bohrn called the Woven Stitch Dishcloth (on the Wayback Machine now, the original is gone) and again I chained a few more stitches than called for. 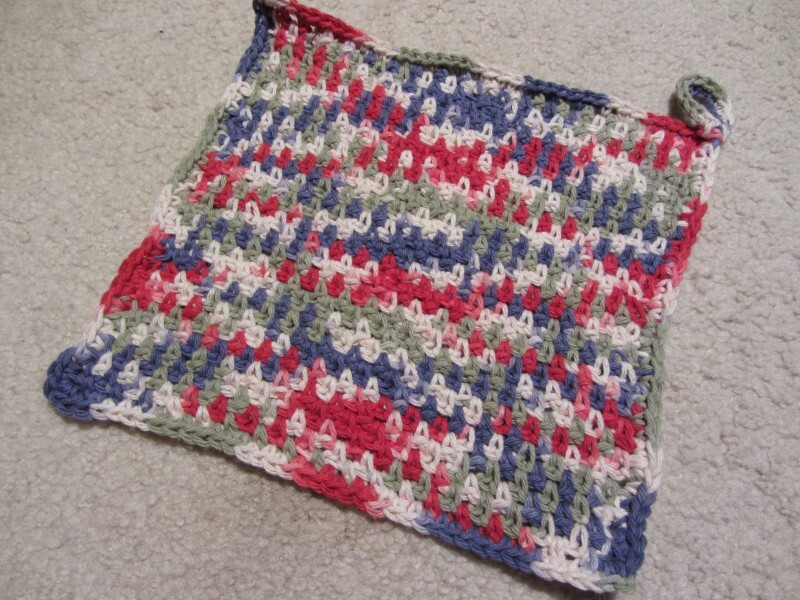 I like bigger washcloths, around 10 or 11 inches square. I got lucky - the number of stitches I ended up with was exactly the right number to give me perfect argyle patterning! 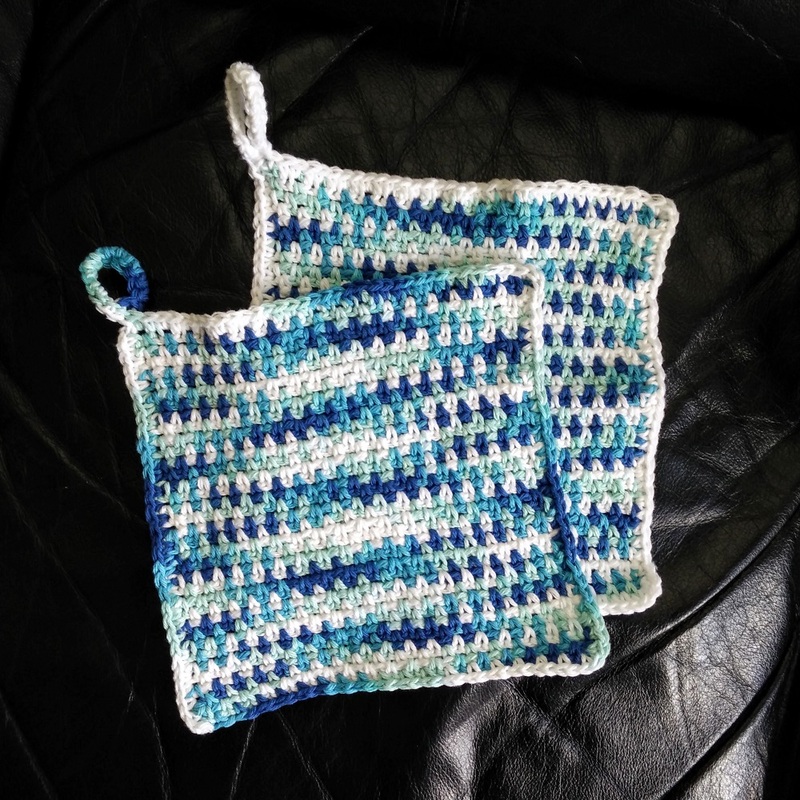 There's a way to figure out the stitch count to make the colours stack or to make the argyle, but it seems like a lot of effort for an instant gratification type of project like a washcloth. I will just be grateful when it happens inadvertently, and not stress about it if it doesn't. 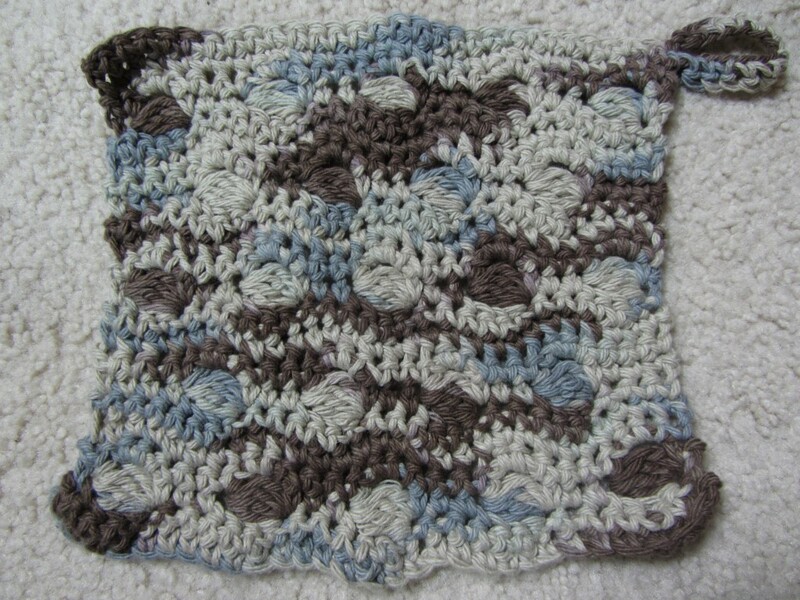 But I bet I'll be making another washcloth with this pattern and the same number of stitches to see if I can make it happen again - I actually picked this pattern because of the number of projects made with it that did end up argyling. Is "argyling" a word? Well, it is now. 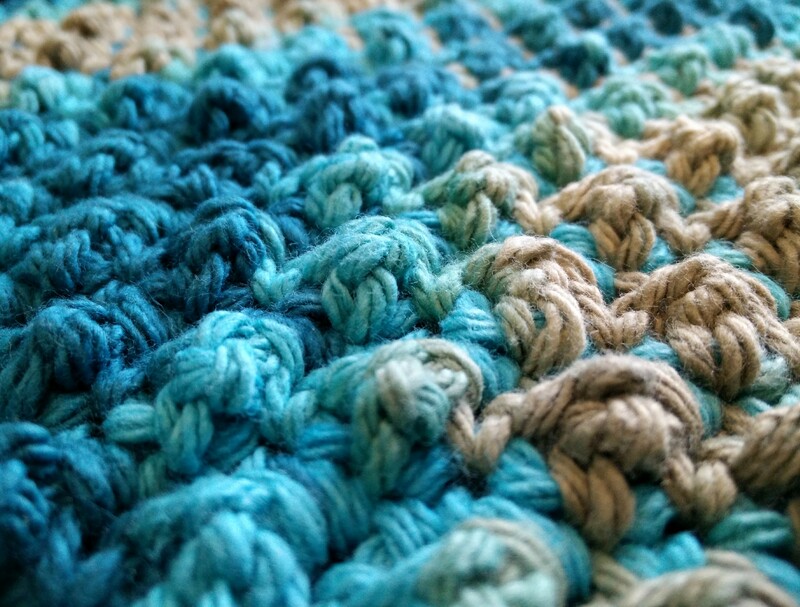 I really like the texture of these crocheted washcloths. They're knobbly enough to be properly scrubby, but the cotton is soft enough so it doesn't tear off any skin. The only thing is, they seem to take forever to dry! This is partly because they're 100% cotton, and partly because I have to keep the bathroom doors closed so the cats don't get into any mischief in there. If I make some cloths for the kitchen to use as dishrags or counter-scrubber rags, I'll make them with more holey-space out of leftover acrylic, something like Over the Rainbow from the same author as the cloth I just made. Red Heart is scratch enough to wash with, but not so much as to scratch the dishes. Or I'll buy some tulle and work with that. Not only will the cloths made of synthetic yarn dry faster, but it's mold-resistant and won't harbour any germs, and will stand up to the frequent washing and scrubbing better than an all-natural fibre will. I have heard that the tulle scrubbies are perfect for cleaning glass stovetops, as well. And now, to pick the next pattern. I'm on a roll here!